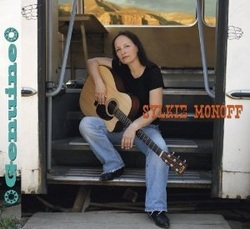 German born and Nashville working, Sylkie Monoff has a new album. It’s melodic, well crafted and engaging. It has a host of musical hard-hitters, and the tunes quickly become familiar. Look for a description. Be precise. Make it real. Call it genuine. Genuine – complete with its hot roster of players: Eddie Bayers (drums), Brent Mason (guitars) and Danny Parks (acoustic guitar and mandolin) to name a few – is for me one of this year’s more rewarding arrivals. Across this pleasing and varied album, Sylkie is easy on the ear with a sensitive honesty for sharing life, love and the journey both bring. With a career that spans back to the early 90s, Monoff has spent her time honing her craft via the weary path of touring, the occasional recording venture, while networking solidly in and around Nashville. The effort has paid off. Genuine is a fluid, reflective and candid entrée to the wider possibilities that should now open up to Sylkie Monoff. With a voice that doesn’t default to Music Row dictates, and with song writing that is sharp, smart and revealing, Monoff is Christmas timely for those who like their music with edge. Rather than just another girlie wannabe with a guitar, Monoff – more Gretchen than Faith -- brings stylish grit to her album. Tracks like the opener “Laughin”, with its female slant on the pain of break-ups, through to “Steal Your Crown”, with it’s Oprah advice of “who can steal your crown if you don’t bow your head?,” onto the closer “Where My River Runs”, with its power-driven guitar, laced harmonies and solid vocals, Monoff nails and delivers on all 13 self-inked tracks. On an album that shares its heart and soul across the tears, joys and bumps of Monoff’s perspective, “Can’t Be Worse (Than L.A.)” is a standout. With a breathy vocal ache Monoff, who adds Producer to her skill set, snares listener interest with a tale of airport farewells, complete with the “other woman” as her beau’s new travelling companion. The experience, as Monoff tells, can’t be worse than being in the L.A. traffic with a million strangers everyday. The freeway crawl, push and pull, and the familiar snarling of tested drivers and tortured passengers is an easy understood metaphor to the ache of a final goodbye. A modern dictionary tells us the word genuine means free from pretence, affectation, or hypocrisy. It suggests the named article is authentic, true, unaffected, open, honest and forthright.